Secure an outward swinging door in seconds. Secure an inward swinging door in seconds. The design of both The Sleeve and The Rampart door security devices came from a group of teachers from Iowa with active shooter situations in mind. Seconds matter. Fighting Chance Solutions provides easy-to-use and effective door security solutions that require no additional installation or permanent modifications to doors. Fighting Chance Solutions’ door security devices were used during a real active shooter event in California and withstood a door breach attempt. This event is the only known time a secondary door security device has been put to the test and succeeded in an actual active shooter situation. The Sleeve and Rampart help protect thousands of schools, workplaces, places of worship, military, and government institutions in all 50 states. 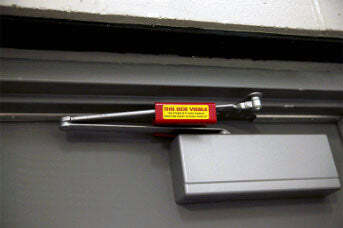 The easy-to-use device placed over the door closer arm to secure a classroom in an emergency intruder situation. The Sleeve2 does not permanently attach to your door. The Sleeve is the fast, easy, and effective way to secure your outward swinging door in the event of a lockdown. The Sleeve2 offers immediate activation, simply sliding over the door closer arms to provide the room occupants with peace of mind. The Sleeve security door stop allows occupants to lockdown and secures an outward swinging door from the inside against an active shooter. Unlike many security products, The Sleeve requires no permanent structure modifications or maintenance to secure your classroom or office door. Schools and commercial buildings in all 50 states use The Sleeve. Many states have added the product to their approved lockdown doors stops list. When Seconds count, The Sleeve could save your life. You think it can’t happen at your school, but it’s becoming a reality more often. Art Rocha was in charge of a lab directly across the street from the UCLA shooting. "You know, we were all kind of nervous in not knowing where the shooter was and that was when I remembered that I had that Sleeve. We did feel a lot more secure with this and that there was no way he was going to be able to come in. Even if he shot the lock off, the way this sits up on top I can guarantee you there was no way he was going to be able to come in." The Sleeve prevented a door breach during the attack. There have been hundreds of school shootings in the last few years. Teachers desperately tried to protect themselves with last-minute attempts to secure classroom doors. When seconds count, you could be out of time. But not with The Sleeve. Designed by teachers, for teachers. The Sleeve fits over any door closer. Incredibly fast activation. The patented design secures all outward opening doors from the inside. With twelve different sizes, The Sleeve fits all door closers. Used in offices, dorm rooms, even hospitals. American made. An inward swinging door brace that is placed under the knob or handle of a door to secure a room in an emergency intruder situation. The Rampart provides room occupants with peace of mind, as they can secure all inward swinging doors from the inside. It is the perfect door brace solution for homes, offices, dorm rooms, hospitals, and municipal buildings. Engineered to the highest specifications in the industry. The Rampart is the easiest and most effective solution to protect rooms with doors that open inwards. 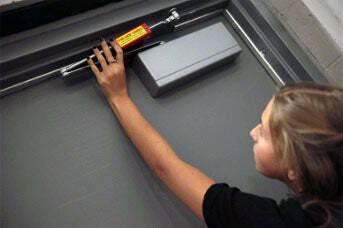 Ready for deployment in seconds to protect the front door of your home, office door, or inward swinging classroom door. Schools and commercial buildings in all 50 states use The Rampart. Many states have added the product to their approved lockdown doors stops list. When Seconds count, The Rampart could save your life. You think it can’t happen at your workplace, but it’s becoming a reality more often. There have been hundreds of workplace shootings in the last few years. Workers desperately tried to protect themselves with last-minute attempts to secure unlocked doors. When seconds count, you could be out of time. But not with The Rampart. Placing The Rampart is quick and easy. Grab, set, kick. Inward opening doors can be quickly secured. The Rampart is the strongest door bar on the market. Designed to put security at your grasp. Unlike more widely sold door bars that collapse under minor stress, The Rampart will hold against a constant violent attack. The Sleeve and The Rampart by Fighting Chance Solutions provide superior door security devices that will "Buy you time when time's not for sale." They say necessity is the mother of all invention. That is precisely how the active shooter safety device, The Sleeve, came into being. The principals of Fighting Chance Solutions, a group of five educators from Iowa, went through active shooter training in 2013 at their school. The training instructions said that if a shooter comes into the building the one place that you can't be is in the hallway. The shooter is more likely to be in the halls. That makes sense, but the problem is that most classroom doors are only lockable from the outside. The doors are equipped with a one-side locking mechanism. Schools built this way made sense originally because you would only need to lock the door two times a day. Once when you arrived, and again when you left for the day. Now, with the proliferation of active shooter situations, the necessity to be able to secure your door from within the classroom, or any room, has come to the forefront. Most classroom doors have door closers because of the Americans With Disability Act. The door closer enables the door to remain open so wheelchairs could come in or also be pulled shut automatically because of the fire code. Utilizing the fact that most doors have door closers, the training instructed teachers to tie belts or cords around the door closer to secure it. Those arms wouldn't be able to spread apart, so the door wouldn't be able to open. During the training these teachers went through, they went through the process of tying a belt around the door closer. The person who was imitating the active shooter came to the door and pulled on it once. The belt stayed. However, after the second pull, the belts sheered in half, and he was able to come in. The instructor then told all the teachers, "Basically you're dead because I'm in the room." Daniel Nietzel, the founder of Fighting Chance Solutions, saw several problems. Most importantly, the solution provided to secure a door from within failed. It didn't work. The second issue is that even if it did work, the act of securing the door with a belt took about two minutes. Those seconds don't exist in an active shooter situation. The average active shooter situation lasts between three to five minutes max. So, the "belt solution" is ineffective and time-consuming. The Sleeve is effective for many reasons. It is straightforward to use and takes very little thought. Field testing shows that It is intuitive. Everyone understands what you are supposed to do with it. You've grabbed the device, and you slide it down all the way to the end of the door closer mechanism, thus securing the door. The Sleeve goes on and off easily in a one-step activation easy movement. No more two minutes and hoping that you tied the best knot of your life. No reliance on any fine motor skill other than can you slide your arm from right to left. The Sleeve is made up of 12 gauge carbon steel and is very effective at securing the door closer. The Sleeve is widely approved nationwide. Most schools will not allow any modification of the door, or the floor because of asbestos issues or just that they don't want holes drilled into their building. Understandable. Many states have put The Sleeve on its approved secondary lock device list and are offering the ability to have waivers signed so that The Sleeve can be put into use. The Sleeve is small enough to fit into a purse, a coat, a dress, a desk drawer. It is easy to conceal and widely used. The Sleeve does not make any permanent modifications to a door, door frame, door lock, or any building structure. The Rampart is to secure inward-swinging doors commonly found at home or in offices. The Rampart is another product designed out of necessity by Fighting Chance Solutions. It fits along with their design philosophy of, "easy to use, fast, and simple security without making any modifications to the structure or building." The Rampart is a door bar device that goes underneath the handle of all inward-swinging doors. Inward is important. We see most inward-swinging doors in a residential or business type atmosphere. The Rampart is made of high-quality aluminum and with specially researched rubber that works on all surfaces including carpet, industrial strength carpet, tile, cement, hardwood floor. The rubber is designed to stick effectively and hold in place against rigorous attacks on a door. The Rampart also has some unique design characteristics that set itself apart from other products in its category and does not allow for a lot of options. The holes are drilled very specific for all standard heights of door handles and door knobs. The distance between the floor to the knob or handle is critical. The foot of The Rampart does not bend in any way. It forces you to create the strongest triangle between the door handle or knob and the floor. By not allowing many height options the structure remains strong. Many competing products have holes drilled all over the product which weakens the metal and thus the effectiveness of the product. The Rampart utilizes a pin system that slides all the way through, so there's no chance of a quick, easy pushpin getting slipped, sliding or breaking. The pin goes straight through the product, thus allowing and preventing the product from telescoping under pressure. The Rampart secures doors from within, and it provides occupants with a peace of mind. The Sleeve is something no teacher wants to have to use, but it gives me a little more comfort each day knowing it’s there. The product was easy to install and was easy to show teachers how to use… The product works as promoted.